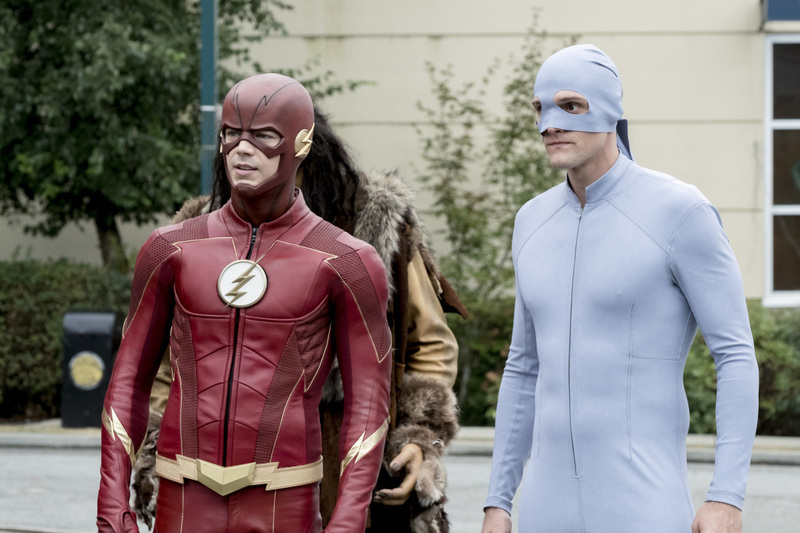 The Flash -- "When Harry Met Harry..." -- Image Number: FLA406b_0028b.jpg -- Pictured (L-R): Grant Gustin as The Flash and Hartley Sawyer as Dibney -- Photo: Katie Yu/The CW -- ÃÂ© 2017 The CW Network, LLC. All rights reserved. During Fan Expo Vancouver 2017, Tom Cavanagh gave a preview of the Council of Wells calling each version worse than the other. And boy was he ever right. Also, Cavanagh must have had a blast playing all of them. But before we get to any of that, Dibny and Barry team up to stop the latest bus meta. This week’s meta is a First Nations woman by the name of Mina Chayton aka Black Bison, who is targeting owners of parts of a Sioux necklace. Mina was a former university professor now turned activist. Team Flash discover this meta when Iris and Barry take Dibny to see their therapist so she can perform hypnosis on him. Dibny recalls meeting Weeper and seeing a woman with a Bison on her jacket. The Flash — “When Harry Met Harry…” — Image Number: FLA406a_0233b.jpg — Pictured (L-R): Grant Gustin as Barry Allen and Jesse Martin as Detective Joe West — Photo: Katie Yu/The CW — ÃÂ© 2017 The CW Network, LLC. All rights reserved. We then see Black Bison/Mina go to an import/export place to target a man carrying a briefcase. When Barry and Joe arrive at the scene, it looks like he was mauled to death by a cougar and see a statue nearby. Sure enough evidence shows that the statue was indeed the killer as blood was found in its mouth but it also had a large amounts of dark matter. Team Flash learns about the necklace pieces and knows that Mina is going to target a private collector who has one of the pieces. So Dibny suits up (it is a pretty awful looking suit) to help Barry save the collector. At the collector’s place, Mina is there and controls a suit of armor to attack him. The Flash and Elongated Man arrives but the Flash has to let Mina go when it looks like the collector is going to be killed by the suit of armor. Dibny isn’t happy that Barry let Mina get away but he counters that he will always choose to save a life over catching a bad guy. So when the final piece of the necklace is being moved by a museum, Mina uses a caveman statue to attack a guard to grab the last piece. The Flash and Elongated Man arrive while the Flash battles the caveman. During the skirmish, power lines are downed and people are in danger. Barry is out for the count and can’t get people to safety while Dibny has Mina in his grasp and is not willing to let her escape. Unfortunately, a young girl gets hurt and Dibny sees that he could have saved her. At the hospital, Barry and Dibny learn the young girl will be okay but Dibny still feels extremely guilty. Barry visits Dibny in his PI office and Dibny talks about how before he would just do his job and go home but now he can’t just do that. Barry offers to be there for Dibny if ever he needs to talk to someone. Barry also says that they did get the bad guy. But of course Mina escapes using a police tactical dummy demonstrating some tech to do so. Mina heads to the museum that has all the piece of the necklace. Also, nice job The Flash production crew for turning the Orpheum into a museum, I barely recognized it. Mina grabs the necklace and sets a T-Rex bones after Barry and Dibny. When Dibny has to choice to save a guard or catch Mina, he chooses to save the guard but then gets caught up with the T-Rex. Barry does catch Mina after throwing a Sioux artifact in the air and she drops her guard to try and save it. It looks like Mina’s motivation was all about preserving her heritage. We then learn that Dibny sent back to necklace to the Sioux people and then paid a visit to the hurt young girl. Dibny entertains her by twisting his rubber arm into different balloon animals. Dibny gets the suggestion from Caitilin in the product-placement extended scene. Harry is getting frustrated over his inability in identifying who is Devoe and tells Team Flash that is going to call in his friends for assistance. Cisco and Caitlin are surprised Harry has friends outside them. Earth 22: Wells 2.0, an Aussie Mad Max type with a Borg-like eye who likes to eat rats and apparently ate the Cisco on his Earth. However, Harry gets frustrated with all the Wells, thinking they are not offering anything to get them closer to identify who is Devoe. Wells 2.0 suggests going after all the Devoes including the baby one. All of this frustration causes Harry to hang-up on all the Wells. Cisco goes to talk to Harry and the reason why he is so frustrated is because the Council of Wells are him. Cisco tells Harry that he chose those Wells for a reason and to bring them back. Cisco even says “You’re a wizard Harry,” like Hagrid. So Harry bring back all the Wellses and they do come up with a suggestion in how to find Devoe, which they do. Harry identifies him as Clifford Devoe and he lives on 43 Hibbard Lane. The Team Flash thinks they are finally going to be ahead of their enemy. However, Barry is very wrong because at the top of the hour, the Mechanic tells the Thinker that Team Flash is very close to finding him out. The Thinker is ready for them and relates they will still win. When Joe and Barry arrive at the house, the Mechanic answers the door but looking more like a suburban housewife and identified Clifford Devoe as her husband. When Clifford comes to the door, he is in a wheelchair looking like a college professor.